IN BETWEEN huddle during the weigh in Wednesday for tonight’s ‘Undefeated’ boxing card, Gerry Peñalosa’s in-laws said the former two-time boxing champion isn’t hanging up his gloves yet. “Gerry will fulfill his commitment to Top Rank’s Bob Arum,” said former city councilor Ditdit Llido whose daughter is married to Gerry. A fight, possibly a championship tiff, for Gerry could be held in December, his father-in-law disclosed. Gerry signed a promotional contract with Bob Arum, although he is still legally obligated to Oscar de la Hoya’s Golden Promotion, with the consent of the latter, of course. At 37 years old, Gerry might be old for boxing. But his past ring exploits and physical gifts make him at least five years younger. Thanks to a two-year hiatus between 2002 and 2004. Frustrated after two failures to recapture his super flyweight crown, Gerry decided to hang up his gloves. The brief respite, however, rejuvenated the Cebu-raised son of former Philippine welterweight champion Carl Peñalosa. Buoyed by Manny Pacquiao’s sensational conquest of Marco Antonio Barrera, Gerry came back from retirement in 2004 to rack up five consecutive victories before suffering a tough controversial decision loss to Daniel Ponce de Leon. A fight later, he knocked out Jhonny Gonzales to win his second boxing crown in as many weight divisions. With father time slowly catching up and eager to land a nig money fight, Gerry accepted the offer to square off with rising boxing superstar Juan Manuel Lopez for the latter’s WBO super bantamweight title. The loss was the first stoppage suffered in his career that spanned over 20 years. Amazing! But looking at his official boxing record, Gerry began his pro career at 17 years old in 1989 – winning his pro debut with a 5th round knockout of Fidel Jubay. Gerry is nowadays busy looking for local boxing talents. 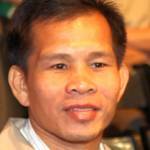 He thinks he has a potential world beater in Bicol pugilist Michael Fariñas. Tonight, Gerry will co-promote with JM Sports Promotion the card headlined by local rising knockout artist Jether Oliva who goes up against Thailand’s undefeated Paithong Muangsima. Gerry politely declined to give insight to his future bout. His mother in law Virgie Llido said Gerry will concentrate on promoting boxing cards and managing aspiring professional boxing. Gerry is also consultant to PLDT’s Manny Pangilinan who is embarking an ambitious long-term plan to capture an elusive gold medal in Olympic boxing. Gerry has acceded to stall the professional debut of his nephew for a shot of Olympic glory, a move seen as Gerry’s way of paying back the sports that catapulted him to fame.